I noticed on Tuesday that Roots is no longer open for lunch. It's a little disappointing. I had been excited a year ago when they started being open for lunch, since that's the time of day when it's easiest for me to sneak off for a pint of blog research. On the other hand, it's not a huge loss, because lunchtime service was terrible. A few months ago I got all the way through a pint waiting on a club sandwich... on my next visit I made the mistake of ordering a hamburger, and waited -- I'm not exaggerating -- one hour for it. On both occasions, there were only five or six patrons in the place, so it's not like the kitchen was slammed. Not long after that I bravely wandered in around 1 PM to spin the wheel again. When I got there I joined three people waiting at the bar to order their first pint; when no one showed up to slake our thirst for all of 10 minutes, I tucked my tail and ran. They did go through rough times but not because of the economy. I am guessing this got started with Jason Mcadam the co-owner and head brewer leaving Roots recently. I have not heard this publicized anywhere. But he has to get bought out so a lot of money is owed to him and others but Roots is basically hunkering down to pay off their bills. Also they were hit hard with the distributor shake-ups and mergers. They are becoming more of a brewpub and you will see less of the beers distributed around town. The lunchtime closure kind of goes against Ezra's "more of a brewpub" comment. I also have to wonder if moving away from distribution is a good idea. 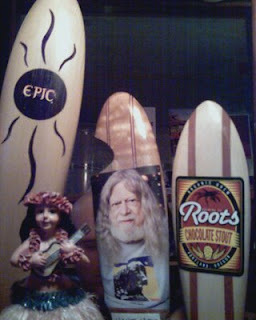 It was one of the notable things about Roots when they first opened: their beer was everywhere in town. I'm not an expert, but you would think that's got to be good insurance against the ups and downs of the tavern business. We may get a two-fer here. Hopefully Craig will weather this rough patch and keep turning out burly organic beers at Roots; meanwhile Jason will undoubtedly put down roots of his own, it will be interesting to see what his next venture is. I gotta disagree with you on their lunch service. I always got my beer and food within a reasonable time (minutes). Perhaps it was hit or miss; but for whatever reason I always had a good experience. And if they open it up for lunch again, I'll return as a regular. gepr: Could be that I'm unlucky, but three in a row really turned me off. Hope springs eternal, though -- on Tuesday I was going to give it another try until I saw they were closed. Nothing worse than "Root Rot!" I have never been for lunch. I do stand by what I said about them trying to make it more of a brewpub. But they definitely are going through hard times and they had to cut back because I think they bit off too much. A lot was counting on the NAOBF because Craig owned that. I understand things are on the upswing but it was definitely tight. Hopefully the NAOBF went well. The attendance I think was on track to match last year. I do have more then I can say to tell about this and I know a lot about Jason's future endeavours but until its more concrete I will keep it zipped. think I made it sound like Craig used to own the NAOBF in that last comment. He still does. Nice article Bill. I wish the Roots the best of luck with their new structure. I hope Jason puts his Roots down somewhere else for sure, meaning it's all about the beer, regardless of the financial business, and if they keep brewing they'll be happy.